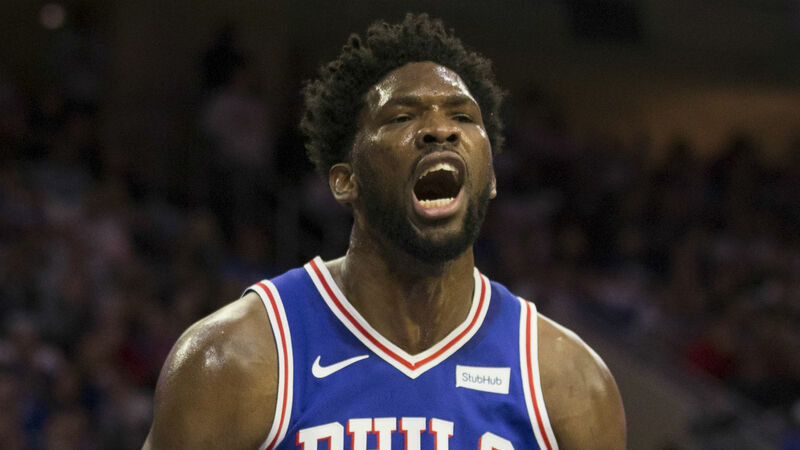 Joel Embiid was determined to live up to a nickname as he led the Philadelphia 76ers to a 133-132 triumph against the Charlotte Hornets after overtime. The 76ers led by 21 points in the third quarter against the Hornets at Wells Fargo Center on Friday, but Kemba Walker helped close the gap and forced an additional period. Embiid, who finished the match with a season-high 42 points and 18 rebounds, hit a game-tying three-pointer with 34.4 seconds left in the fourth quarter and was 14 from 16 from the free throw line across the last period and overtime to keep Charlotte at bay. Asked what was going through his mind in those late moments, Embiid said with a smile: "Gotta make them. They call me 'Clutch' for a reason, so gotta make them. "In practice they call me 'Clutch'. I'm still yet to show it in a game, tonight I felt like I did a better job of that but that's my job. I've got to step up when there's an opportunity. "I can use power, I can use finesse. Last year in the last-minute situations I struggled a lot and I feel I've been doing a better job. Still got a lot to show and still got a lot to improve on, so I'm excited." Philadelphia coach Brett Brown felt comfortable depending on Embiid to score free throws at key moments down the stretch. Brown said: "He's a really good shooter anyway and he's confident by nature, so that's a pretty good collision of skill and mind that you trust him going to the line and shooting a high percentage. He's not afraid of the moment."